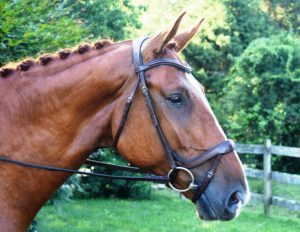 The new Red Barn Arena Ergonomic Bridle features advanced fit designs providing extra comfort for the horse. 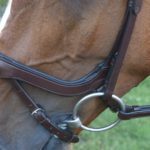 The Arena’s key features include an ergonomically-designed noseband, adapted to fit the horse’s anatomy, alleviating pressure on the main facial nerve; and a softly padded, extra wide crownpiece to evenly distribute poll pressure. 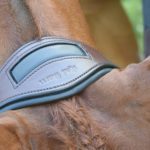 The Arena is complete with a shaped, padded round-raised leather browband and ½” cheek pieces. 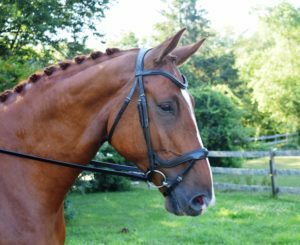 (This Bridle is sold without reins) All hardware is stainless steel, hook-stud end, with a roller buckle on the adjustable noseband. All Red Barn bridles are handcrafted with the finest Sedgwick’s English leather.